New plans for the University of Wolverhampton’s School of Architecture and the Built Environment at the £100m Springfield Campus have been approved. The City of Wolverhampton Council has granted planning permission for the scheme and it is hoped initial work will start on site in May. The original scheme was altered after pre-construction works on the historic site discovered structures of some of the original buildings were not viable so could not be incorporated into the plans. Associated Architects has designed the new School which centres around the original clock tower building and combines it with a striking large new build element. The iconic clock tower building will be restored and a new building wrapped around it. At its heart will be a naturally lit open atrium spanning three floors, covered by a glass roof lantern. The 7,900 square metre build will use a mix of pre-cast white concrete, bronze metal cladding and glazing. An impressive saw-tooth roof will echo the historic industrial buildings that stood on the site and there will also be a feature translucent light-box, which mimics the former Springfield water tower tank that was destroyed in a previous fire. Outside will be a landscaped piazza and courtyard linking the new School together with the rest of the site and the historic outer brick façade will be retained. When completed, it will provide space for nearly 1,100 existing students and 65 staff, with the number of students projected to grow over time to more than 1,500. Deputy Vice-Chancellor Jackie Dunne, who is the University’s project lead for Springfield, said: “We welcome the decision to grant planning permission by the council and have worked very closely with the planning department, Historic England and other groups to get to this point. “We are now very much looking forward to the next phase by actually getting on site and moving the project forward. “We think the new design is really exciting and will be a fantastic addition to the city. Springfield is a key strategic project for the University and we are committed to realising the vision of the site and the part this will play in regenerating Wolverhampton. Tim Johnson, City of Wolverhampton Council Deputy Managing Director, said: “It is a major boost for the city to see approval granted for the School of Architecture and the Built Environment revised plans. It is wonderful to see the former Springfield Brewery site growing into the reality of a European-leading Built Environment education campus in the City of Wolverhampton. “This historic site, which had been vacant for over a quarter of a century, is being brought back to life as the University’s £100 million Springfield Campus. Multi-billion-pound regeneration is changing the face of our city and creating a wealth of attractive investment opportunities. “Impressive strides have already been made in the City of Wolverhampton and several other high-profile multi-million-pound developments are taking place at the Mander Centre, Civic Halls, railway station and on Westside. 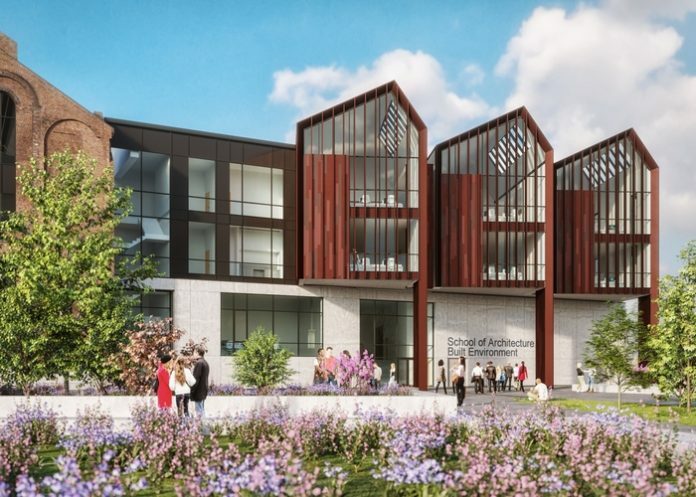 The plans for the School of Architecture form the largest part of the first phase of the £100m redevelopment of the site to create the Springfield Campus. The aim is that it will still be delivered in the 2019-20 academic year as planned. It will join the West Midlands University Technical College, which opened in January 2017, and the Elite Centre for Manufacturing Skills Hub, which will open this year. Now planning permission has been received the scheme will shortly go back out to tender to identify a construction partner. The scheme is being project managed by Rider Levett Bucknall. The design team is also made up of conservation advisors Rodney Melville & Partners, mechanical and engineering by Couch Perry Wilkes, quantity surveying by Faithful and Gould and structural and civils engineer Atkins, which will also provide landscape architecture.